It's a bird. No it's a plane. No! it is SD Superman!! Wait a minute.... something not quite right.... What's with the logo? That is not a S... Oh no! 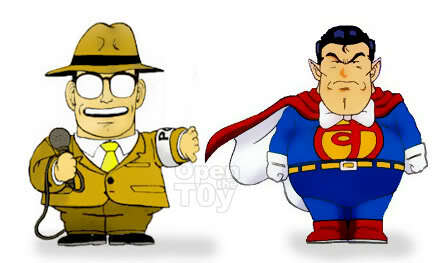 That is Suppaman from Dr. Slump! So who is this Suppaman? The word Suppa in Japanese means Sour and a during the transformation (changing of clothing), you can see he will be eating some sour prune. Suppaman like Superman came from a planet far far away. Like Superman, he disguise himself as a reporter and change into his costume in a phone booth. 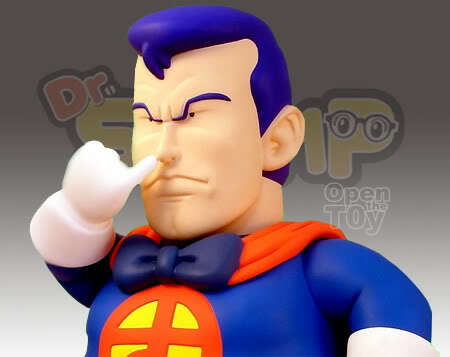 Unlike Superman, Suppaman has no super powers and worst, no sense of justice. He often rolls around with his belly on a skateboard mincing flying in the air. His weapon of choice, throws explosive grenades like a terrorists. He enjoyed boasting and taunts before he so called started a battle such as showing off being strong by breaking 3 bricks with one punch, which also hurts his hand. Often enough when he realized the enemy is stronger, he beg shamelessly for forgiveness. What he do best? Take a look for yourself. Yes digging his nose. Eleek! Because of his funny persona, he became one of the memorial characters in Dr Slump in the heart of the readers. Dr. Slump was a Manga illustrated by Akira Toriyama before he started Dragonball. It is a hilarious Manga fill with lot of spoof characters. The drawing was cute and one of the kind. 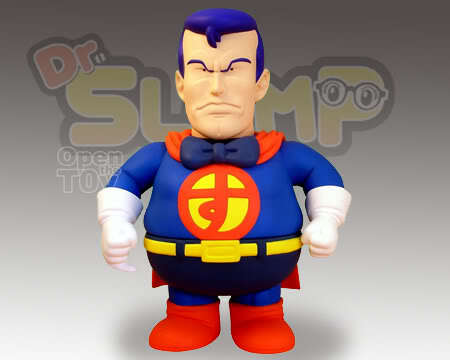 This Soft Vinyl Suppaman by Taki Corporation from Dr. Slump comic is about 24cm. Selling at 4800 Yen and is on sale now. LOL what a funny looking figure! This one looks cute and funny. Have you buy it? If you got the chance, read Dr. Slump. It maybe old but still it is funny. Is it a comic or cartoon? I am not sure if it's the same thing, but is it related to IQ 博士? I think this fellow is from IQ 博士 too! What a funny looking dude! Wah..is this clone of superman? the apposite attitude..hehehehe.. anyway I love his belly..
you read IQ 博士 or Dr slump comic before? If you do, you would have seen him in it. W...T...F... O_o IS this their way of getting back at us after screwing up Speed Racer AND Dragonball?